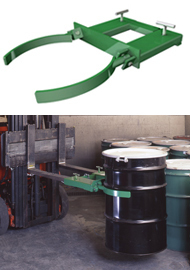 Our item F87398A2 Basic Drum Lift has fork pockets that measure 5.625" x 1.625" x 18" useable. This means you need to measure the width and particularly the thickness 18" from the lift truck fork tips. Since standard forklift forks taper from full thickness two thirds of their length to approx 3/4" at the tip (new) it could be possible to "press fit" this unit to your forklift. Another example of measuring twice and cutting once, as they say.